Wu Yi Mountains 武夷山 is one of the World Heritage Site recognized by UNESCO. It is also in the middle of WooLong tea 烏龍茶 production area. The most famous and the best tea, according to tea connoisseurs, is the Big Red Cape tea 大紅袍 produced only in this mountain. The highest peak of the mountains is a piece of solid rock, reputedly the biggest such rocks in Asia. It measures 600 feet high and 2,000 feet long. Tourists would climb up steep stairs along the edge of the rock. For those who cannot climb this peak, rows of sedan chairs await customers. it costs US$40 for a round trip ride. One day before I started this trip, I was injured doing a samaritan deed in Hong Kong. I saw an elderly man on the railing on a sidewalk, bent 45 degrees forward at the waist, hanging on to keep from toppling over. I helped him straighten up, walked him across the street and then back to his nursing home. In keeping him straight, I overexerted myself and hurt my back and right leg. 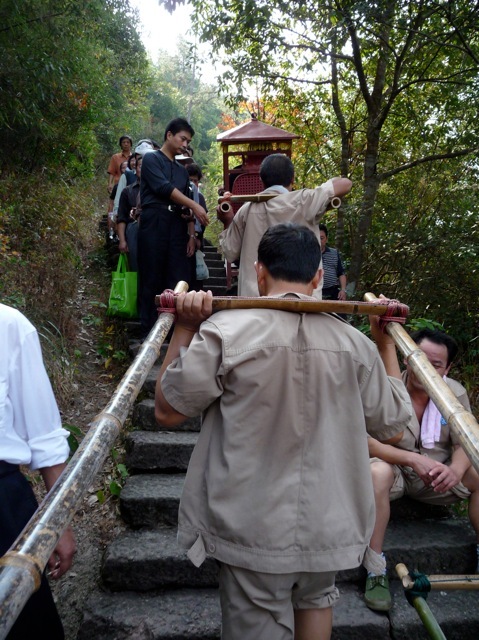 Reluctantly, I had to ride the sedan chair to go up the peak. I felt a bit guilty and embarrassed to be carried by other men, but I had no choice. 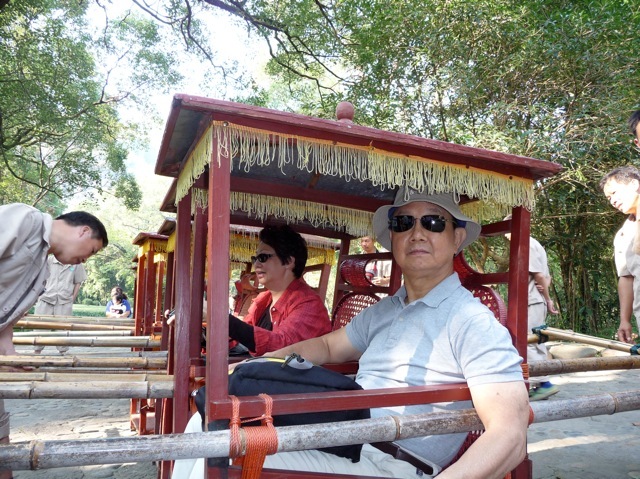 The sedan chairs took the back trail with less steep incline. It was narrow and much traffic jamming had to be cleared. The two sedan carriers would climb 100 feet before they had to stop and rest. The carrier in the back huffed and puffed, and moaned as he labored, adding to my guilt trip. They generally carry two trip a day when the business is good, but in reality get one trip every two days. For their labor, they get about US$10 each per trip. Those who climbed the peak by their own feet had spectacular views. On top of the peak, some men cooled off by removing their shirts. 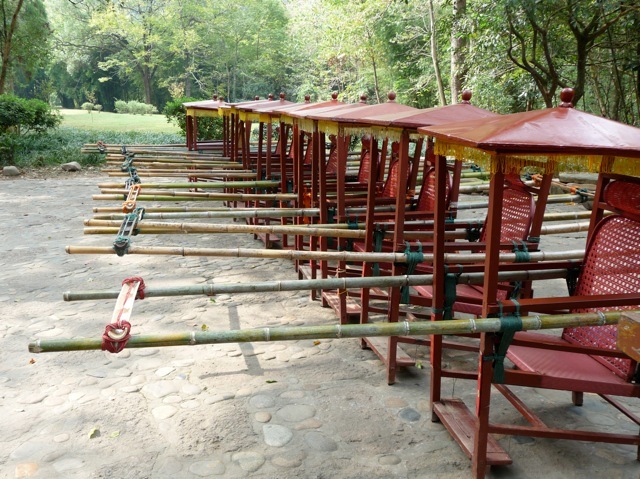 The next de rigor thing to do was to ride the bamboo rafts down the river. 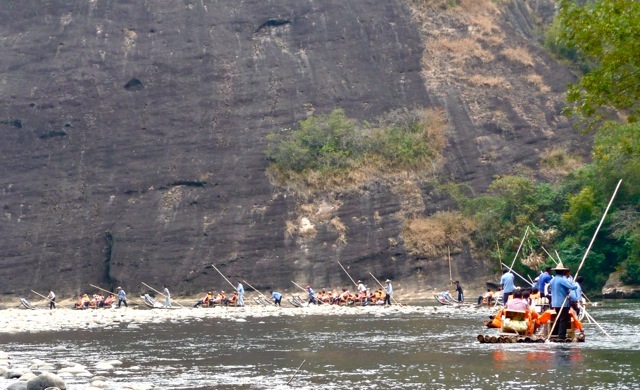 Hundreds of bamboo rafts clogged the river as they floated past peaks and rock faces. 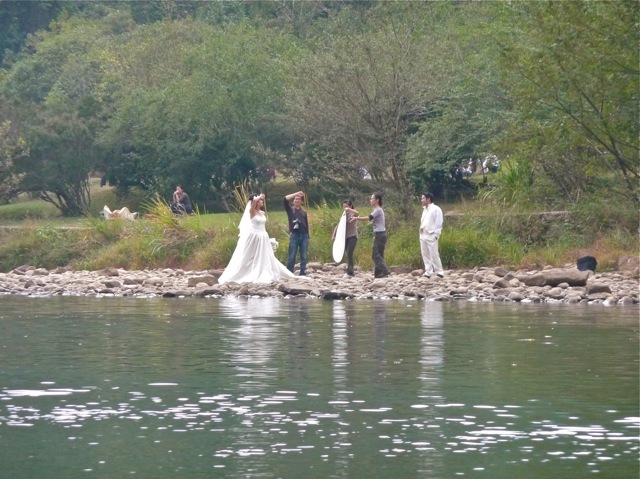 A bridal party was on the shore taking nuptial photos in a beautiful natural setting. The bride was being coached to pose for the camera. 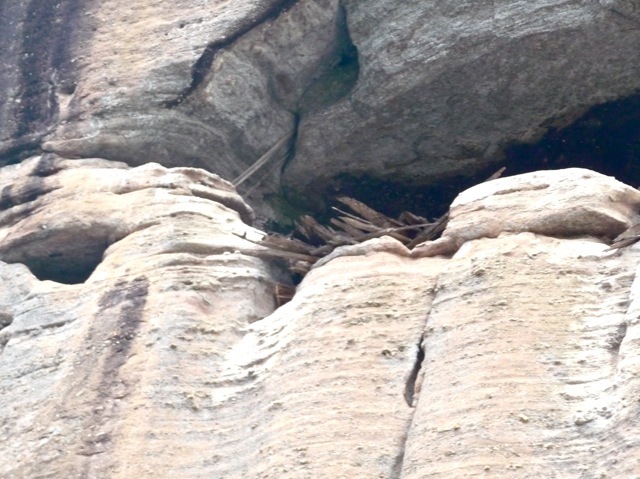 In one of the caves high on a cliff, the remains of an ancient “hanging coffin” was visible. These are relics of an ancient people who lived in this area, but no information exists on who they were or how they managed to carry the heavy coffins hundreds of feet up the cliff. 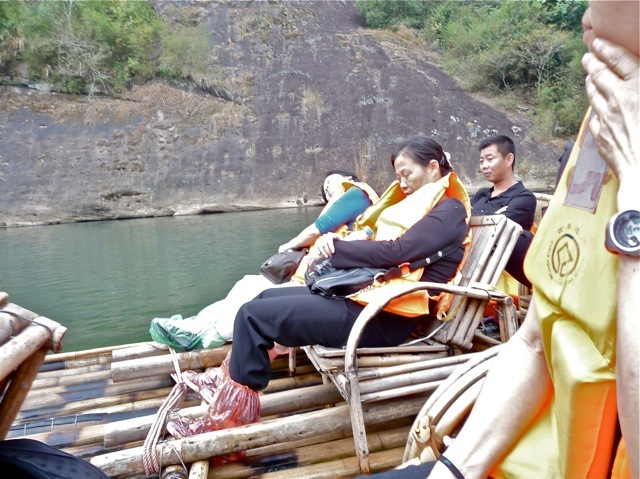 The two hour raft ride proved too boring for some tourists. 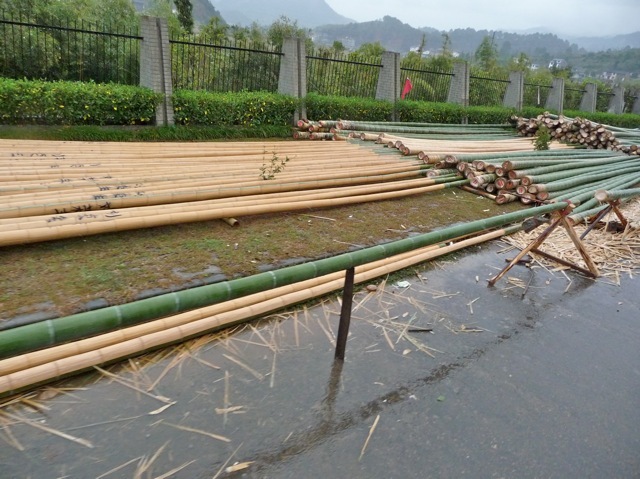 In a nearby town, giant bamboos were being shaved and formed to make new rafts. 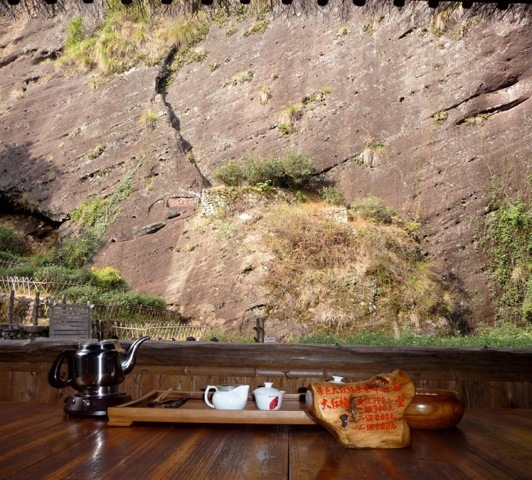 The Mecca of tea drinkers is the Big Red Cape tea in Wu Yi Mountains. The original seven bushes are still growing on a ledge. Cuttings from these bushes were grafted to become big fields of “Big Red Cape” brand tea. The tea from these seven original tea bushes were drunk only by the emperor, and has been auctioned today for US$40,000 per ounce. For tea connoisseurs, it must feel like going to Mecca to drink Big Red Cape tea in a bamboo tea house facing the original tea bushes. Nearby, a dam was drained for repairs. 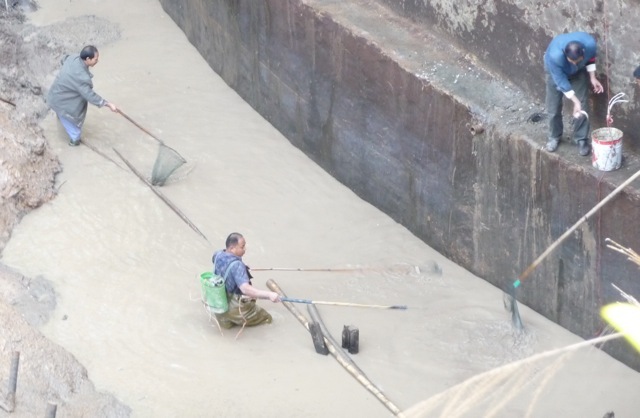 A man used an electric device to stun trapped fish, netted them, and carried them away in buckets. I believe they were releasing the fish in another pond, for it would be much easier to just drain all the water and remove the dying fish in the remaining mud. 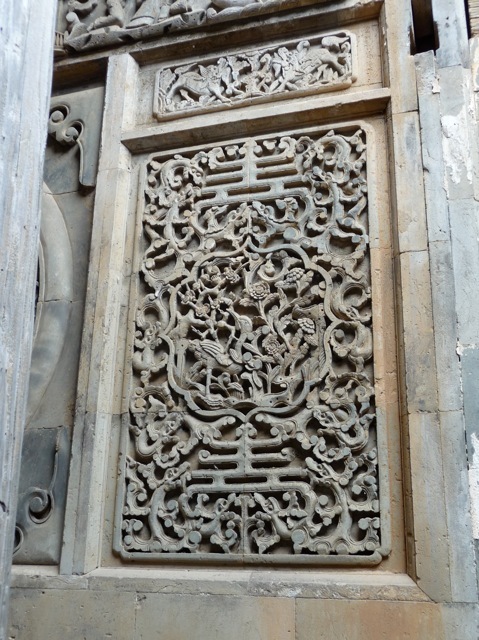 I took a side trip to visit the site of the MinYue 閩越 palace. 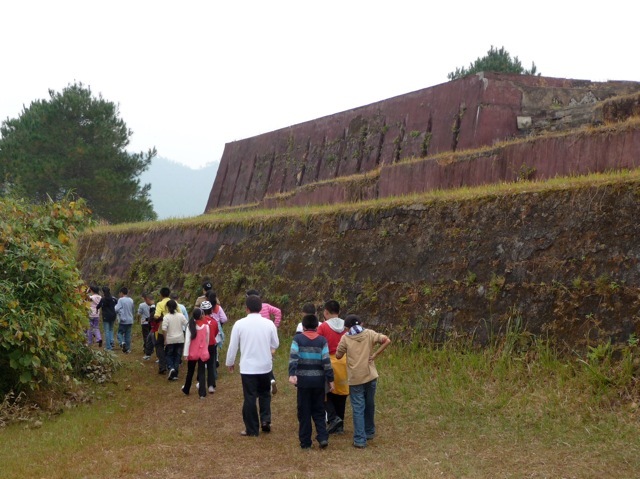 This was a kingdom established 2,000 years ago by a Yue 百越 tribe in today’s FuJian Province 福建. The original paving bricks of the palace. 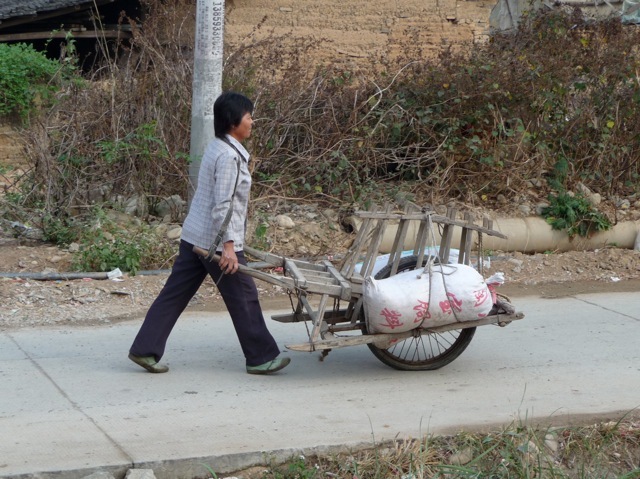 In a nearby village, a woman carried loads using the traditional Chinese wheel barrel. Zhuge Liang 諸葛亮 reputedly invented the wheel barrel 2,000 years ago during the Three Kingdoms period. This Chinese design with the wheel under the load has generally been replaced by the Western design with the wheel in front of the load. 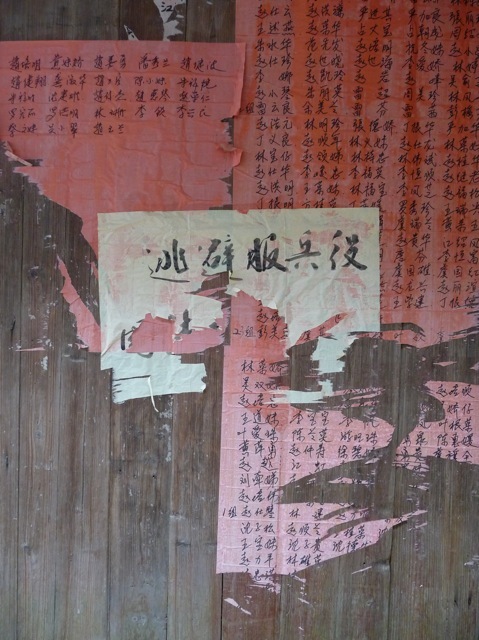 A tattered slogan on the village bulletin board exhorted young people not to avoid being drafted into the army. I find this a reflection of the human nature of the Chinese common folks. 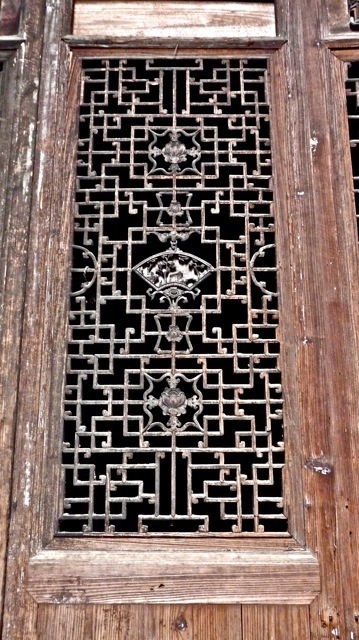 When in China, I enjoy seeking out old latticed window frames and carvings. The following were found on this trip. This perfectly preserved frame was found in a village, probably once belonged to a rich land owner. 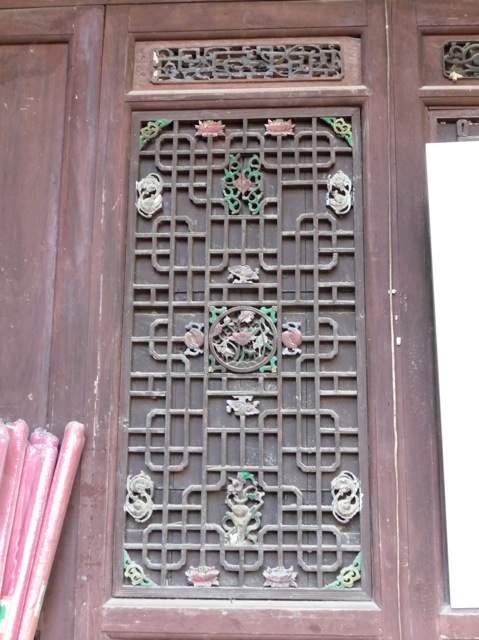 This subtly colored and perfect window frame was found in an ancient temple. 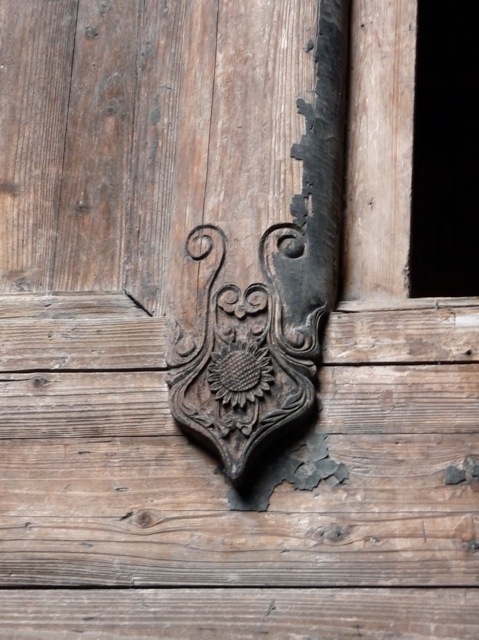 This elegantly simple carving was found on an ancient house in the mountains. 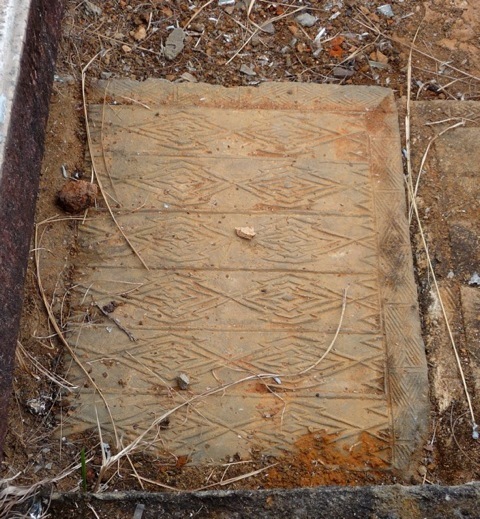 This brick carving graced the doorway of a rich merchant’s house in a tea distribution town. Posted by Robert Wu on Monday, December 14, 2009, at 9:38 am. Filed under Uncategorized. Follow any responses to this post with its comments RSS feed. You can post a comment or trackback from your blog.